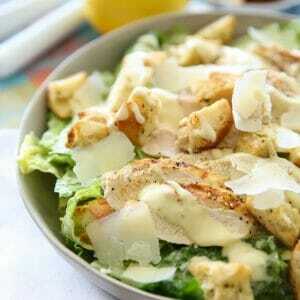 Everyone loves a great restaurant Caesar salad, but not too many people make them at home. Really great, classic homemade Caesar dressing involves things that often weird people out (me included), namely raw egg yolks and anchovies. When we were developing recipes for our second cook book, I really wanted to come up with a fantastic Caesar dressing that was easy to make, just used normal pantry ingredients and no eggs or canned fish. 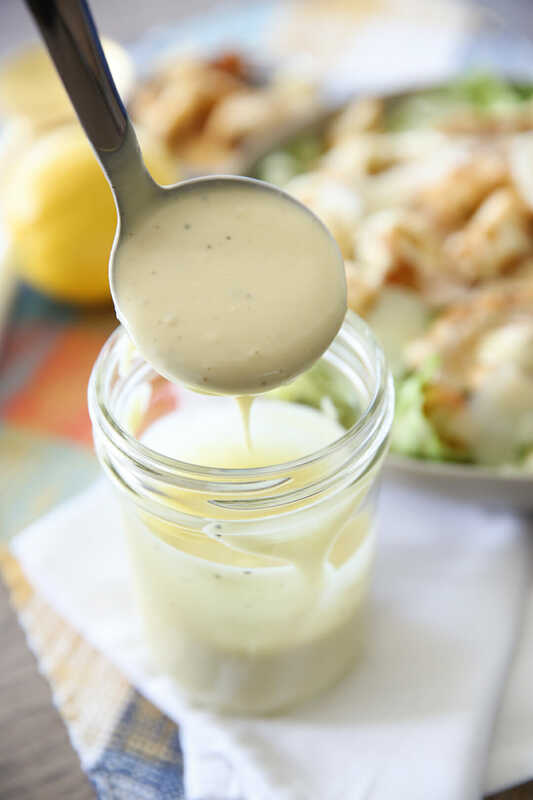 This dressing has become a staple at our house ever since. It’s creamy and fresh and tangy and great on SO many things. 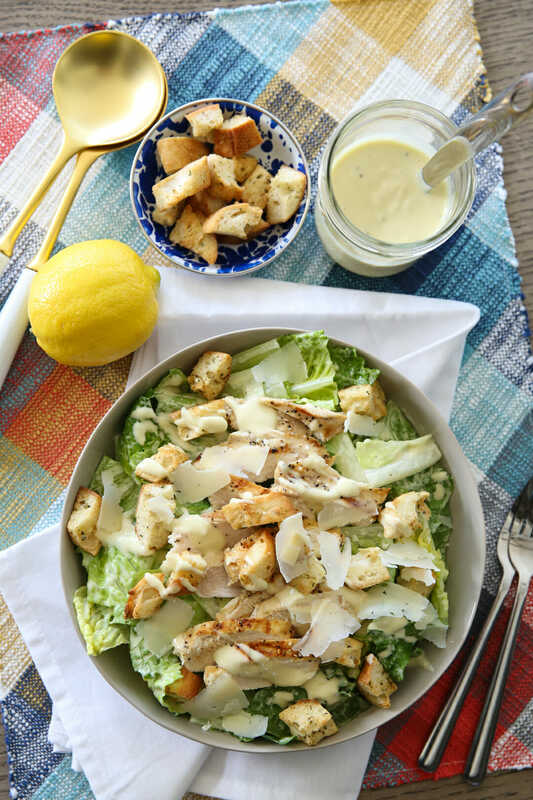 And I’m telling you right now- take the time to make this homemade dressing, and whip up some homemade croutons and grab some fresh Parmesan and you will have literally the best Caesar Salad of your life right at home. 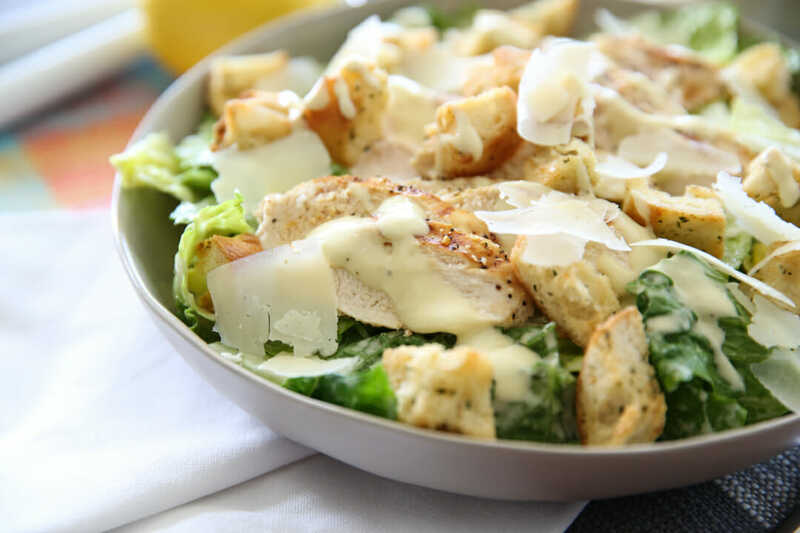 Caesar dressing is so easy- you’ll start by blending some mayo, garlic, salt and pepper and lots of fresh lemon juice in a blender, and then blend in olive oil. Now you’ll want to use a good olive oil here because you will definitely taste it. I almost always use our garlic or our lemon olive oil, but our plain house oil is great as well. If you don’t love the taste of olive oil, you might try using a “light” one. Light olive oil isn’t referring to the calories or anything, it’s simply light on flavor since it’s the oil after the first presses where the good stuff comes from. This dressing is great used as a marinade for chicken, as a dip for crudités or drizzled over chicken and lettuce in a wrap. To make the best salad ever, use cold, crunchy romaine and toss with the dressing. Pile on plates and top with homemade croutons, fresh Parmesan cheese, and grilled chicken if you want. The best! 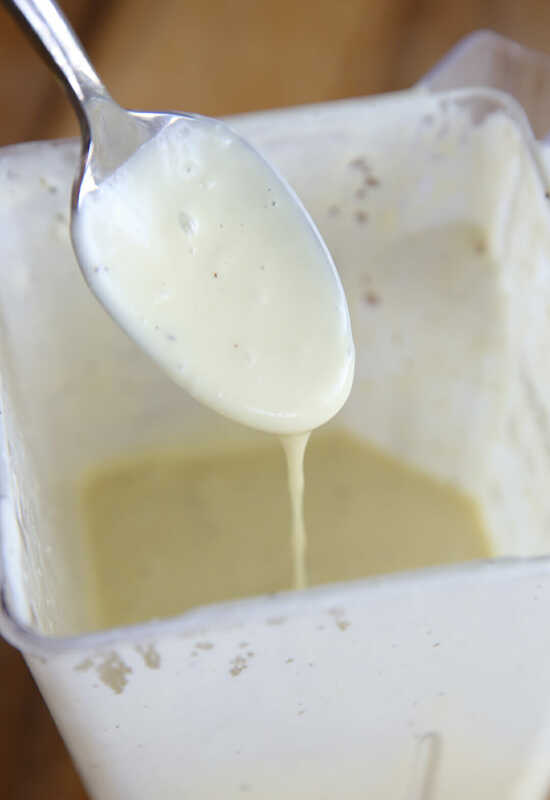 Combine mayo, mustard, garlic, lemon juice, vinegar, salt, and pepper in a blender and process until smooth. With blender running on low speed slowly pour in olive oil in a steady stream just until fully incorporated. *If for some reason your dressing ends up too thick (can happen if you process too long) just add a tablespoon or two of milk). Store in fridge. 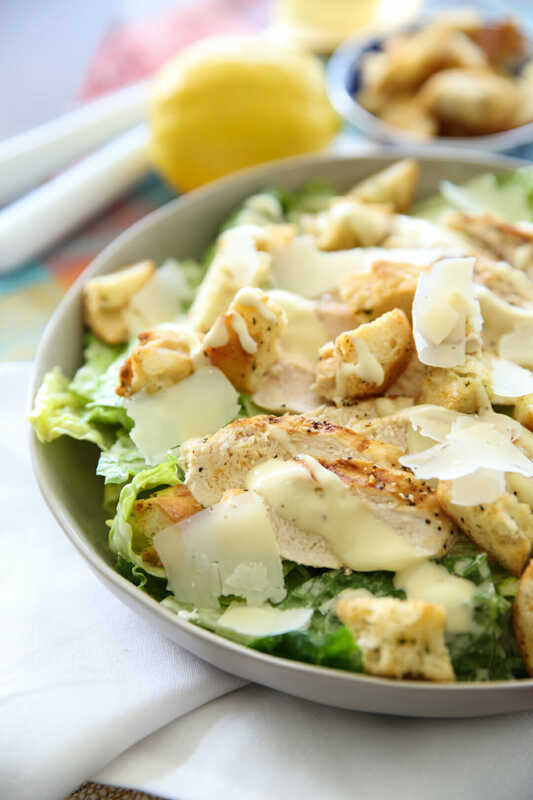 To make Caesar Salad, toss dressing with chopped romaine lettuce and then top with fresh parmesan, croutons, and grilled chicken if desired. Garnish with lemon wedges. Looking for more Fast and Healthy meals with fresh ingredients? Check out our Fit and Fast Meal Plans, 6 weeks of healthy meals and organized grocery lists to make life easier! This looks so good! I haven’t had Caesar salad in ages! I am SO happy you posted this recipe. My kids discovered Caesar Salad about a year ago and it’s the only kind they will ALL eat. It’s also the only kind I didn’t have a homemade dressing for because I never wanted to mess with the eggs and the anchovies. And I have your second book, but apparently I’ve never looked in it for Caesar Salad dressing. I love the idea of marinating the chicken in the dressing. I’ll be making it this week for sure. I’m so glad- I hope you love it! This looks delicious. What kind/brand of mayo do you use? I’m picky about my mayo and I only use Best Foods (or Hellman’s depending on where you live). It’s my favorite! We’ve used Hellman’s since we were kids. I find it has a chemical sort of taste. Ken’s Extra Heavy is really good, but for some reason, very hard to find now. Used to get it at Sam’s Club for about $8 per gallon. I see it on line now for $70 per gallon!!!??? Wow, that better be some good mayo! haha! What is copped romaine lettuce? Or does that mean cold romaine lettuce? This was so yummy! I have that cookbook and never made it, so I’m glad you highlighted it here! My husband, who isn’t a salad guy, said he loved it and asked me to make it again! Totally a win in my book! How did you make the grilled chicken in this recipe?? I just sprinkled with salt, pepper, garlic and onion powder and then sautéed in garlic olive oil in a pan. Simple and delish!